It was a cold December night when many amazing artists came to Madison Square Garden to raise the roof at New York’s annual Jingle Ball, produced by the Los Angeles radio station KIIS-FM, better known as Z-100 in New York. As it is such a popular concert among people of all ages, tickets are hard to get your hands on because they sell out so quickly. The positive to this is that for every ticket purchased, $1 is donated to the Ryan Seacrest Foundation – a non-profit organization dedicated to inspiring today’s youth through entertainment and education-focused measures. It is special that people can come together to watch all of their favorite artists perform on the same stage while helping young people get a step closer to following their dreams. 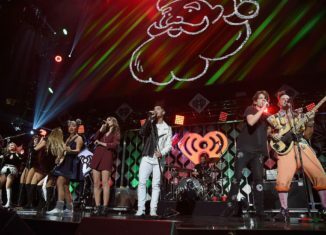 This year’s lineup at Jingle Ball was Justin Bieber, Ariana Grande, Diplo, The Chainsmokers, Fifth Harmony, Ellie Goulding, Charlie Puth, Lukas Graham, Daya, DNCE, and a special guest appearance from Niall Horan. It was an amazing experience and a perfect combination of artists. The bonds that were created between the performers are incredible, and it is clear that they all had such a good time performing with each other. Three acts that should be recognized were those of DNCE, The Chainsmokers, and Charlie Puth. DNCE is an American funk pop and dance-rock band. The group consists of members Joe Jonas, Jack Lawless, Cole Whittle, and JinJoo Lee. In addition to performing some of their own hit singles, they covered “Wannabe” by the Spice Girls and “Fade” by Kanye West. The addition of these two songs to their performance really made it unique and memorable. The Chainsmokers are an American DJ duo consisting of Andrew Taggart and Alex Pall. These DJs perform in such a way that makes everyone in the audience roar. The use of special effects in their performances is really what helps them stand out. During the concert, when the bass of their songs dropped and the beat began, fire was ignited, and it spewed out onto the stage. This duo of DJs definitely knows how to put on an epic show. Much like Justin Bieber, Charlie Puth Jr. is an American singer, songwriter, and record producer who gained his initial recognition by the viral success of his song posts to YouTube. His act, unlike the other two named, was so simplistic. It consisted of him playing the piano and singing along to his meaningful hits “We Don’t Talk Anymore,” “See You Again,” and “One Call Away.” It is such an accomplishment that his act had the crowd going crazy, being that he is still an up and coming artist. Having the opportunity to witness amazing artists perform first hand was truly incredible. Everyone should definitely attend Jingle Ball in the future if they enjoy what they hear on Z-100… and if they can get a ticket before they sell out, of course! Kayne West: Crazy or Genius?